"The spiritual dimension is your center, your commitment to your value system. It draws upon the sources that inspire and uplift you and tie you to timeless truths of humanity." Wellness is defined today in the dimensions of mind, body, and spirit. Included in these dimensions are physical, mental, emotional, sexual, social, and spiritual health. We cannot have total wellness if we ignore any one of these dimensions. What is spiritual health? The word "spiritual" refers to that core dimension of you - your innermost self - that provides you with a profound sense of who you are, where you came from, where you're going and how you might reach your goal. You may not think much about spiritual health or well-being and what role it plays in your life, but its significance is stronger than you may believe. Spiritual wellness may mean different things to different people. For some, spirituality may be synonymous with traditional religion, while for others it relates primarily to the quality of personal relationships or love for nature. A basic foundation for spiritual wellness may be the sense that life is meaningful and you have found your place in it. The search for meaning and purpose in human existence leads one to strive for a state of harmony with him/herself and with others while working to balance inner needs with the rest of the world. Many of the behaviors associated with wellness are key components of a healthy spiritual life. Examples include volunteerism, social responsibility, optimism, contributing to society, connectedness with others, feeling of belonging/being part of a group, and love of self/reason to care for self. So how can you improve your spiritual health? An article in the October 1992 Balance magazine lists five strategies to grow spiritually. 1) Be quiet. Spiritual truths often come in the form of a still small voice that is difficult to hear above the chaos and confusion of a frantic lifestyle. Set aside time for solitude and meditation. 2) Be open to the spiritual. Spiritual experiences often come in unexpected forms and packages. They surprise us. Foster a nonjudgmental attitude so you're open to the spiritual dimension in any life event - from hoeing the garden, to witnessing an accident, from watching a swim meet to reading the morning paper. 3) Be inquisitive and curious. An attitude of active searching increases your options and your potential for spiritual centering. Don't shut doors before you check out what is behind them. For example, the laying on of hands may be a powerful centering experience. A silent retreat might renew your enthusiasm. Meditation or yoga may very well allow you to experience tranquility and peace. 4) Be receptive to pain and grief. Pain helps us focus on the widest questions of our being. It's a deepener. A life without pain leads to a sparse, shallow existence. Allow yourself to feel your pain fully, then ask, "What is it trying to teach me?" 5) Be playful. Play is a pleasurable, freeing experience. It breeds spontaneous enthusiasm and celebration. When you make music, dance, laugh, sing - however you play - listen for sounds of the spirit. To discover what spirituality means for you and how it can play an important role in your life, consider these questions. Your answers may provide clues to enhance your own spiritual well-being. * What gives your life meaning and purpose? * What gives you hope? * How do you get through tough times? Where have you found comfort? * What are your 3 most memorable experiences? * If you belong to a religious community, how are you connected to this group? * If you have survived losses in your life, how have you done so? * Describe a time or instance when you felt comfortable and that all was right with the world. * Describe a time when your life was filled with a sense of meaning or when you experienced a sense of awe. 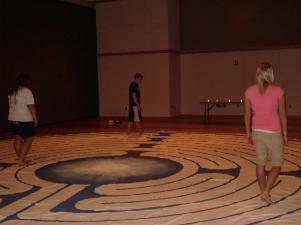 The labyrinth is a tool used here at UNI to help individuals find their inner peace. 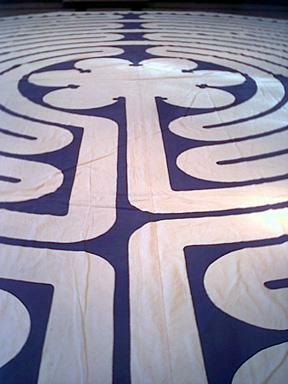 Labyrinths have been used as meditation and prayer tools for many years. Unlike a maze, a labyrinth has one path; the way in is the way out, with the path leading to the center and out again. It is an ancient symbol relating to wholeness that combines a circle and a spiral pattern into a purposeful path which represents a journey to our own center and back again. The activity is a right brain task. It involves intuition, creativity, and imagery. A passive, receptive and open mindset is needed. It is your choice to walk a spiritual path. If you are interested in walking the labyrinth, contact Joan Thompson or call at (319) 273-2137. Joan offers workshops on the labyrinth and has even made it available for academic classes. Please contact her for more information. For more information or further guidance the Counseling Center is available.